Home > News - SEPTEMBER 2016 > Persistency Ratio - ICICI Pru.Life and HDFC Life Insurance..! Persistency Ratio - ICICI Pru.Life and HDFC Life Insurance..! Persistency ratio - ICICI Pru. Life and HDFC Life Insurance..! 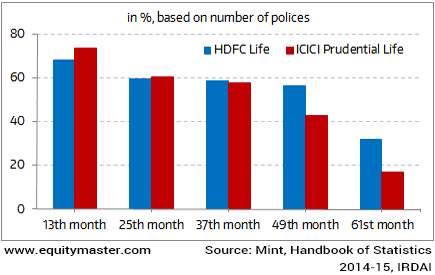 The historical persistency ratio of the India's two leading life insurance companies ICICI Prudential Life Insuranc and HDFC Life Insurance. Persistency levels measure the percentage of customers who continue with their policies after a given period of time. Persistency of Life Insurance Policies, 2014-15. Now, it's quite well known, India is the 10th largest life insurance market globally and has a large unpenetrated insurance market. Thus, it is believed to be one of the leading growth sectors in India.